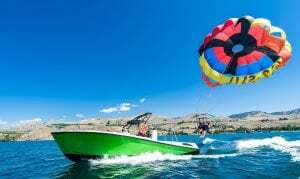 When you want to go parasailing in Seattle, you should consider visiting Lake Chelan for breathtaking views. Here at Chelan Parasail & Watersports, we want all of our customers to have a memorable time when parasailing with us, so we have provided some advice. Check out some helpful reminders before your trip below, to ensure you have a great flight. Weather Conditions- Your safety is always our number one priority, which is why we might have to reschedule your parasailing trip because of the wind or other weather conditions. We recommend planning your parasailing adventure on the first day of your vacation in case we need to reschedule. Understand the Guide- When you are on the boat, it is vital to listen to your guide and understand the hand signals for when you are up in the air. This way you can easily communicate with the guide, and we can communicate with you. Have Fun- Some people take pictures, and others just take in the moment. Do not forget to take in the scenery and enjoy every minute of it. If you have any questions regarding a parasailing trip or want to make a reservation, you can call our team at (509) 682-7245 today.